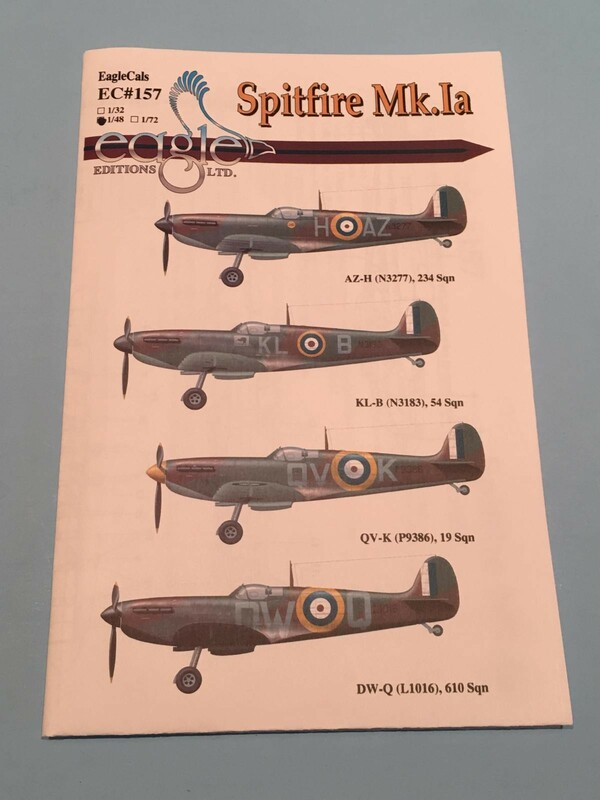 Recently there has been a lot of excitement with Tamiya announcing an all new tool Spitfire Mk 1 in 1/48 scale. But do we need another Spitfire model? After looking at the various photos of the plastic trees, and a video review online, I’m going to say YES! Yes we do… It looks to be a real beauty and I can’t wait to get a few of them. 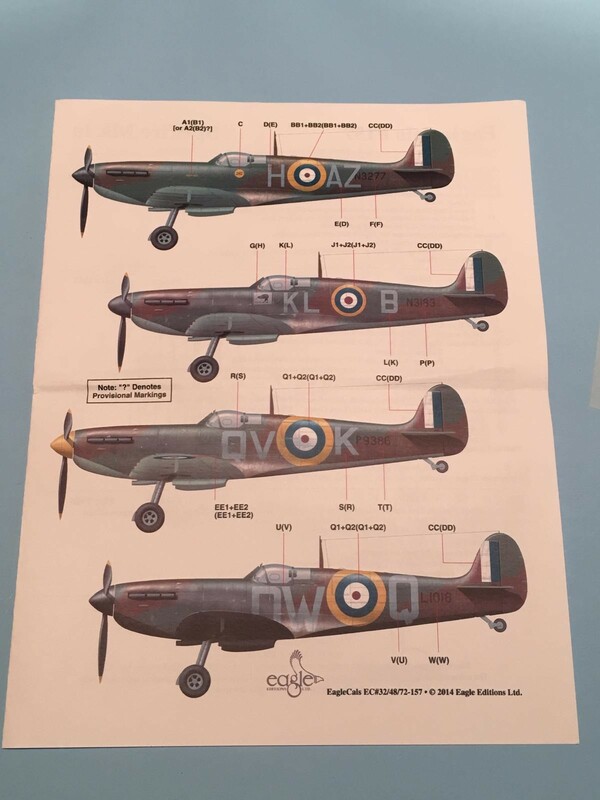 Because of this I decided to do a quick review on this decal sheet, since this is currently available, and it will add more options for the Spitfire builder other than just the kit supplied decals. 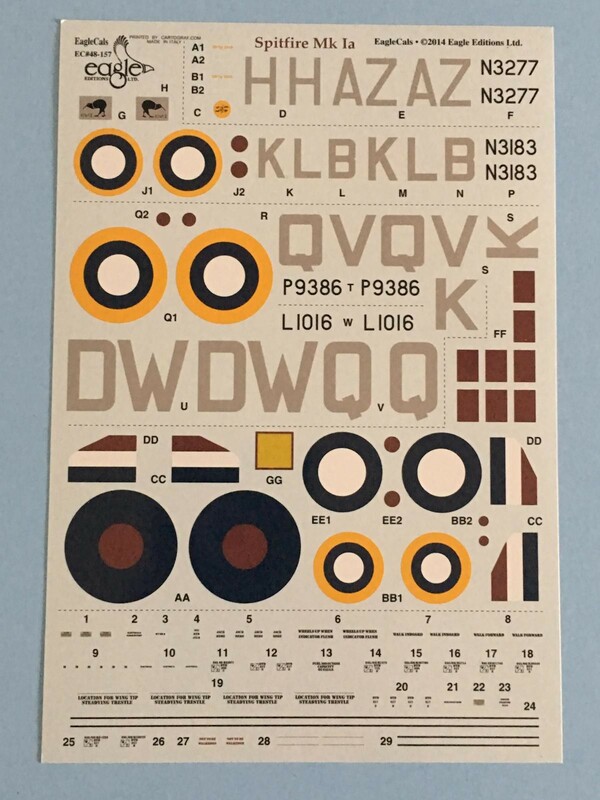 These decals are available in three sizes, 1/32, 1/48, and 1/72, and can be purchased directly from the manufacturer, or through various retail hobby shops. They offer decals for a lot of well researched subjects. Here are the four options, in order from Top to Bottom. The decals are printed very well, with my sample in perfect register. I like the colors too. The red and blues look to be spot on… as do the aircraft and Squadron codes. This company has a good reputation of doing considerable research on the subject chosen. Occasionally, they include photographs that are very helpful with documenting the original planes. Unfortunately no such photos were included this time. But with a little patience and luck, photos can be found on the internet. Each aircraft has the colors Dark Green and Dark Earth listed for the upper surfaces. The lower side (which can be a bit confusing with the time frames given), is another story. Sky Type S is listed for “AZ-H” and “KL-B”, while “Sky” is listed for “QV-K”. “DW-Q” is shown with White and Night Black as the under surface colors, with the dividing line running down the center of the fuselage. A full set of stenciling decals are included. The instruction sheet also has a placement guide for the stencils should you decide to use them. Al Deere’s Spitfire “KL-B / KIWI II” is correctly depicted with the proper Rotol propeller. The rest of these examples have the De Havilland three blade prop. I have used Eagle Cal decals before, and they work very well. The lighter colors have not been too translucent, and they snuggle down well. I used a set on my Heinkel 111and they worked perfectly. No setting solution was needed. Hopefully this set will act in the same manner. Here’s a link to see how the Eagle Cals decals look on the He-111. I’ll tell you soon, when I use the “KL-B” set on one of my Spitfires I have on the work bench now. Cheers, Louis. I think I may be getting one or two of these Tammy Spits, so this is really helpful. Tally ho! I was thinking the exact same thing……………. Two would be nice, three would be perfect !!! 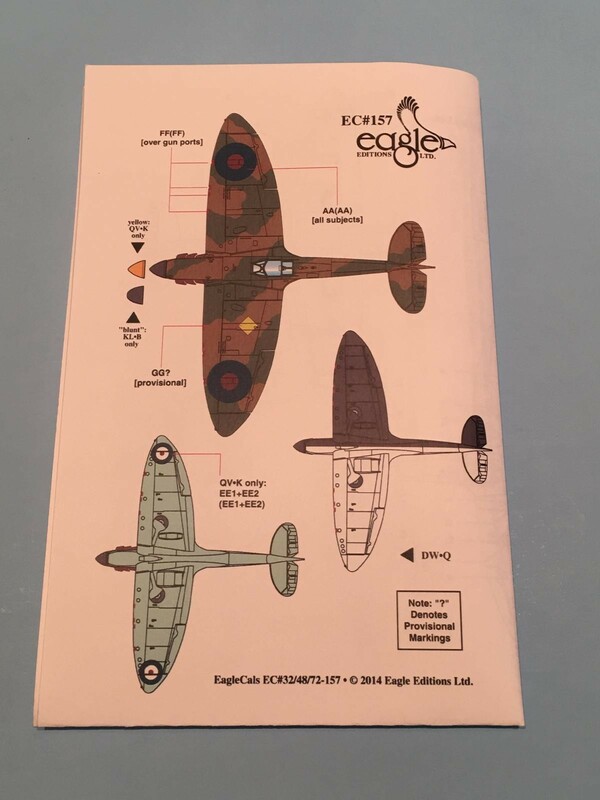 Tamiya apparently has several parts options included with this kit that will allow you to build all but the very earliest of Spitfires, with the two bladed Watts propeller. This is the perfect excuse to use all of the decals on this sheet………….. My story and I’m sticking to it. Happy “All Hallows Eve” my friend. Thanks Craig for the kind words. It’s a very nice decal sheet wich your review does full justice Louis. Question: does the new Tamiya Spit really includes the Watts propeller? I heard otherwise. Thanks for the compliments on this review. To answer your question about the Watts propeller: No it doesn’t have one. My understanding is that it has the De Havilland style prop. The Watts type is not included. One very cool thing I did notice is that the landing gear struts are molded together as a one piece unit. This will perfectly set the rake angle and the wheel alignment at the same time. It’s almost fool proof and “typical” Tamiya very clever engineering. This part looks to be very strong and not a bit fiddly………………. 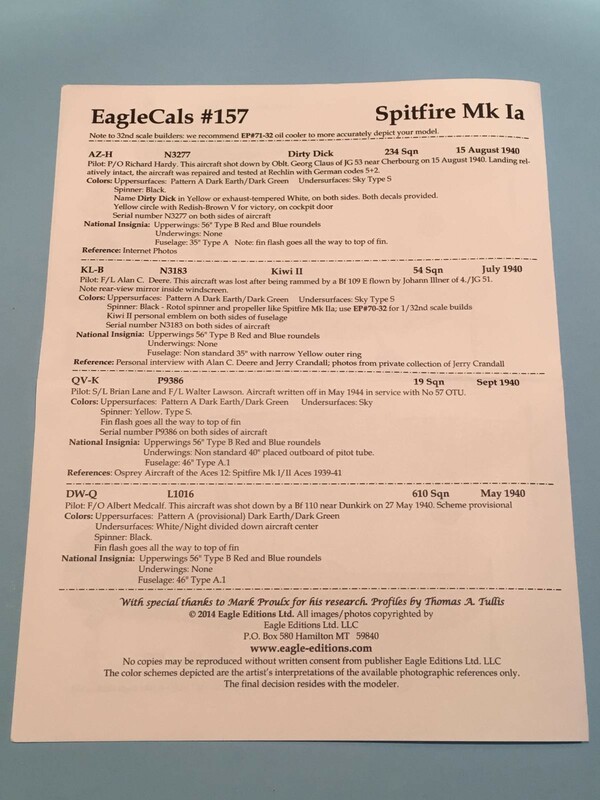 I have a few of the Eagle Cals 109 decal sheets too ……. I hope that these sets will be useful soon when I build up my new tool Tamiya Bf-109’s. Ironically I just noticed that this is my 109th posting here on Imodeler. And it’s a Spitfire article !!!! I guess I really blew that opportunity to write an article about the Bf-109 as my 109th article. I might just have to do that…………. excellent idea, and I have a 1/32 scale Revell one in mind !!!! Thanks for posting Louis. Nice to pick up these tidbits on what’s out there! You’re quite welcome James. As always it’s great to hear from you. You guys bring up an excellent point. 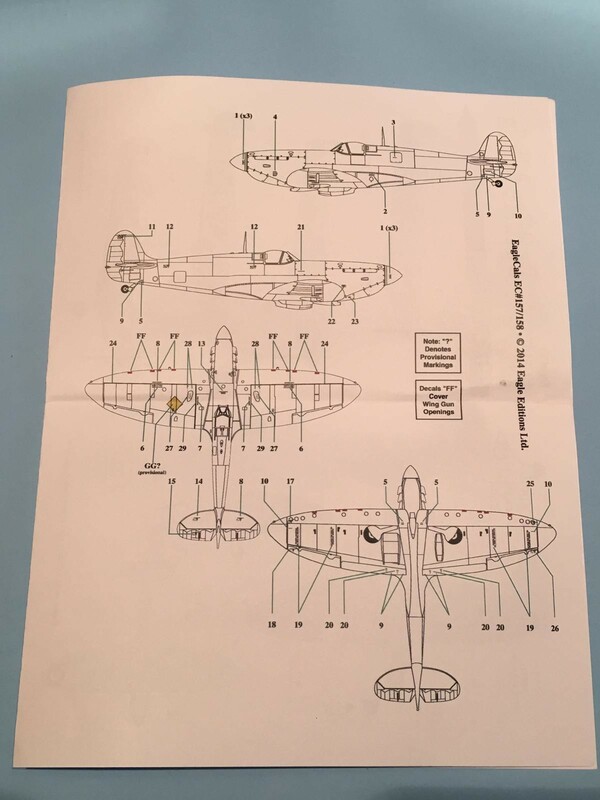 It’s possible they typically choose the “DW-K” as a subject for the decals is there are some original era pictures floating around of that plane. It looks to be a well documented Spitfire. But now with the advent of the Internet, having access to different pictures is now becoming the norm. This would hopefully lead to more decal options in the future. Thanks for the comments gents………….